There’s something bewitching about a restaurant that knows how to make an electrifying first impression. That first step is the key, isn’t it? The door opens. You breach the threshold. And there it is, that initial glimpse of your dining room for the evening. That first sneak peek should have some magic to it. A bit of mystery. Or better yet, a whiff of classy exoticism. Pry open the giant red doors that safeguard the entrance of RockSugar in Oakbrook Center and you’re guaranteed to get a real eyeful. Imagine a wall of flickering candles worthy of a Tibetan monastery, giant Buddha heads staring stoically down from the rafters, and a pair of oversized red armoires weathered to look like holdovers from the days of the terra cotta warriors. It’s a whip-smart mood-setter—full-fledged mystical escapism—that’s trumped only by the adjoining main dining room. Think vaulted ceilings, giant wooden seals on the walls, and the real scene-stealer? Cabana-inspired booths draped with diaphanous curtains that feel like they’ve been plucked from a four-star Malaysian beach resort. Here’s a dining room that isn’t just whispering but shouting, “Go ahead, eat with your eyes.” It’s hardly surprising that the owner of RockSugar, which also boasts an L.A. location, is David Overton, the founder of The Cheesecake Factory. Overton has a taste for grand, head-turning design schemes, but I doubt he’s ever had a chef quite like the man overseeing his two RockSugar locations—Mohan Ismail, whose resume includes stints at New York icons like Spice Market and Blue Hill. The visual panache of the place underscores Ismail’s desire to showcase the culinary pleasures of Southeast Asia—including Thailand, Vietnam, Malaysia, Singapore, and everywhere in between. One of Ismail’s best is a crunch play on salmon tartare which comes with bejeweled bits of pink daikon radishes, small kernels of crunchy green pistachios, and crimson pomegranate pearls. The flavors are spa worthy—cool, breezy, summery—but it’s the dish’s bite, that soft pistachio-pomegranate crunch that deftly avoids the mushy textures that doom so many dishes of this ilk. Ismail has a real command over textures. 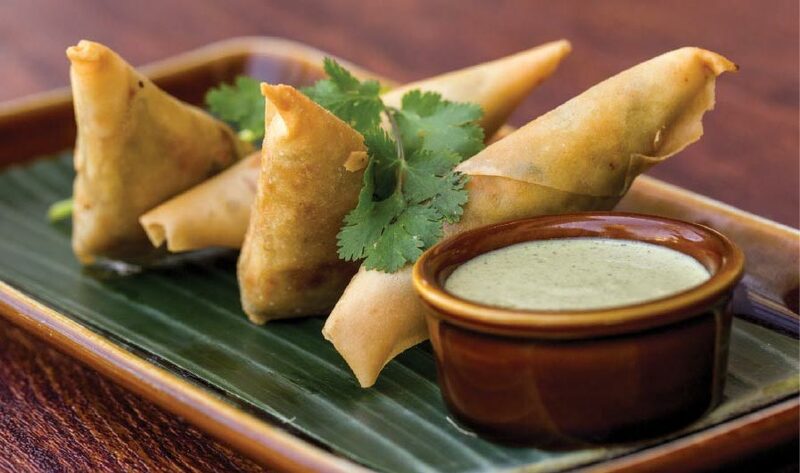 His fantastic samosas are ultra-light and crispy, primarily because he swaps out thick doughy shells in favor of spring-roll wrappers. Thus, his samosas splinter upon contact but give off a distinctly Singaporean spice rush—a flavors that Ismail borrowed from his mother’s recipes. Also take note of the house’s chicken meatballs, which are served in pockets of lettuce and garnished with Thai basil, mint, and cilantro. The exterior of the meatballs mimic the textures of a sticky chicken wing—gooey and slick. But the meatballs themselves are incredibly moist and fluffy. The secret ingredients are water chestnuts, but it’s the umami flavors that he pulls from the mushrooms stuffed inside the meatballs that make them a dynamite dish. If there’s a drawback to the size of RockSugar’s menu—which has a Tolstoy-esque word count—is the sheer amount of options. Some of the house’s signature dishes have elemental appeal. 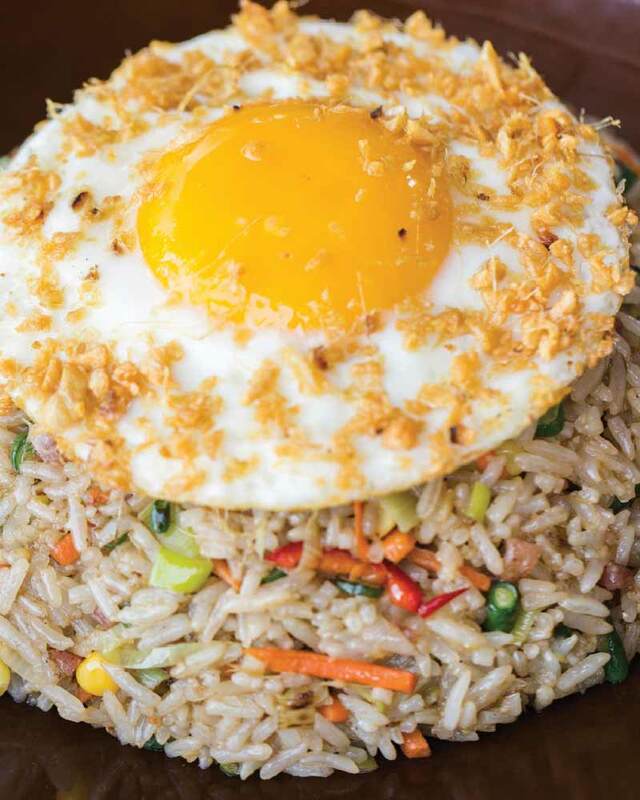 Ismail’s giant ginger fried rice platter is a classic—a mound of sausage-studded rice crowned with a fried egg dappled with bits of fried garlic. Seafood options abound, including an incredibly tender miso-glazed black cod set on a forest of pea shoots and sugar snap peas. 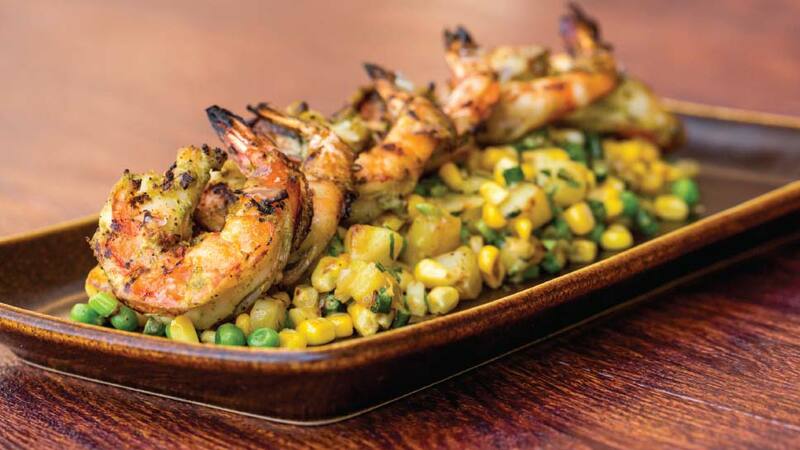 The house’s Indonesian-style grilled shrimp explodes with cilantro notes. But the real surprise was the quality of Ismail’s shaken beef entrée, a stir-fry dish that earned its name due to the skill needed to rapidly shake the wok without burning the beef. In Ismail’s hands, the beef is incredibly rich—think Maggie Sauce on steroids—but adding even a hint Ismail’s lime-ginger marinade sauce transforms the dish completely, cutting the density and buoying the acidity. It’s a great segue into the dessert list, which is filled with plenty of sweet cakes, but scores a direct hit with the house’s fried doughnuts—small square pillows of dough topped with coconut flakes that can be dipped in an pitch-perfect passion fruit sauce. One taste and you’ll know why all the nearby Buddha statues are smiling from ear-to-ear and the place always glows like a beacon in the night. RockSugar Southeast Asian Kitchen, 2022 Spring Road, Oak Brook, 630-320-2641, rocksugarkitchen.com.